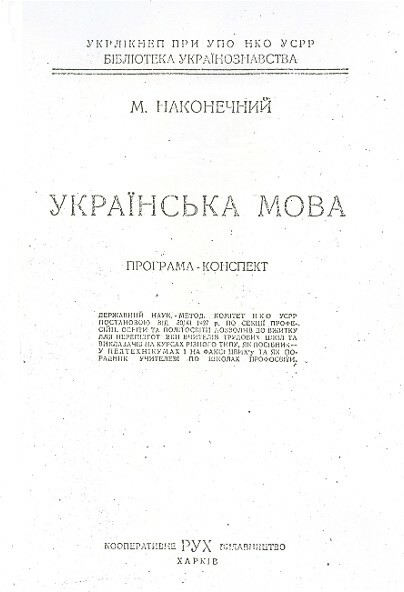 Standard Ukrainian [літературна українська мова; literaturna ukrainska mova]. The standard, or literary, version of the Ukrainian language evolved through three distinct periods: old (10th–13th centuries), middle (14th–18th centuries), and modern (19th–20th centuries). The cardinal changes that occurred were conditioned by changes in the political and cultural history of Ukraine. Old Ukrainian is found in extant Kyivan Rus’ church and scholarly texts dating from the mid-11th century and the Kyivan charter of 1130, in Galician (see Galicia, Principality of Galicia-Volhynia) church texts dating from the late 11th century, and in Galician charters dating from the mid-14th century. There are hardly any literary monuments from the Chernihiv principality, Tmutorokan principality, and Pereiaslav principality; hence, we can only make conjectures about the literary language used in these principalities. In addition to church and scholarly texts, Old Ukrainian is represented by private letters, chronicles, and belles-lettres works. The language of all these genres is basically Church Slavonic, with an ever-increasing admixture of local lexical, phonetic, morphological, and syntactic features. Although the language was not institutionally regulated, it remained quite stable, because of the patronage of the church and the concentration of literary life around religious centers. Thus, texts created in Kyiv do not differ much from those transcribed from the Bulgarian. Some scholars, such as Aleksei Shakhmatov, have conjectured that this was also the koine of the most cultured intellectual strata. Hypotheses (by S. Obnorsky and, to a certain degree, L. Yakubinsky and Ilarion Svientsitsky) about a local, urban-vernacular-based literary language that predated the widespread use of Church Slavonic have not been confirmed by known facts. Only the language of the Galician charters reveals a local character, but data allowing us to date back that tradition do not exist. The growth of towns, the rise of a Ukrainian burgher class, and the influence of the Reformation brought about a shift in the language of the higher genres toward the chancery and vernacular languages. There were even attempts at translating the Bible into a language approximating the vernacular (eg, the Peresopnytsia Gospel [1556–61] and Krekhiv Apostolos [1563–72]). This trend was arrested, however, by the so-called third wave of Church Slavonicization. Polish cultural, political, and economic expansion after the 1569 Union of Lublin led to the Polonization of the Ukrainian nobility and the cultural and political decline of Ukrainian towns, thereby destroying the ground on which a vernacular-based Ukrainian literary language could rise. It was under these circumstances that the clergy assumed ideological leadership of the Ukrainian opposition and propagated the restoration and normalization of Church Slavonic as the vehicle of an older, Greco-Byzantine tradition. The grammars and dictionaries produced by Lavrentii Zyzanii, Meletii Smotrytsky, Pamva Berynda, and others did not revive Church Slavonic in its pure form, but with an admixture of arbitrary changes and with some Ukrainian elements (eg, pronunciation of the nasal vowels , as u, ja; g as h; as i; and the nonpronunciation of jers). The result of this policy was the opposite of what was intended: by severing the literary language from the vernacular and blocking the secularization of the literary language, the church in fact facilitated the Polonization process. In practice even Meletii Smotrytsky's standards of Church Slavonic could not be maintained, and many vernacular elements and Western influences (especially Latinisms and Polonisms) crept into the literary language. Thus, an eclectic language based on Church Slavonic became the literary medium of the Cossack Hetman state of the 17th and early 18th centuries. Its variegated composition suited the prevailing style of the period, the baroque. The language was used in homiletics, scholarship, belles-lettres, and, with considerably fewer Church Slavonicisms, official communication and private correspondence. Given the artificial nature of the language, it is difficult to speak of its dialectal base; in general, however, southwestern dialectal elements prevailed over northern ones. The decline of the Hetman state after the Russian victory at the Battle of Poltava (1709) interrupted the normal development of the literary language. As baroque culture declined and became secularized, tsarist interference, as in the ukases of 1721, 1727–8, 1735, 1766, and 1772 censoring the language of Ukrainian printed books, as well as the Russification of education and the desire of certain strata of the Cossack starshyna and the higher Orthodox clergy to consolidate their position in the service of the Russian Empire, put an end to the printing of works in the literary language of the 17th century. In the second half of the 18th century the literary language used in Ukraine (eg, in the late Cossack chronicles, the writings of Hryhorii Skovoroda and Vasyl Kapnist, and Istoriia Rusov) was, in fact, Russian. The vernacular was used only in satirical, humorous, intimate, or lyrical works, as prescribed by the classicist theory of low style. The authors of such works did not envision creating a new literary language, but merely recorded various ‘Little Russian’ dialects (eg, the northern in Ivan Nekrashevych, the Poltava in Ivan Kotliarevsky, and the Kharkiv in Hryhorii Kvitka-Osnovianenko). The attitude to the vernacular changed only with the rise of romanticism, which in Ukraine acquired a distinctly populist flavor. Various writers, such as Markiian Shashkevych, Amvrosii Metlynsky, and Mykola Kostomarov, raised the possibility of a serious, full-fledged literature based on the vernacular. They preferred folklore, which was associated with a historical tradition, to colloquial speech as a source of the literary language. Thus, the southeastern dialectal base (see Southeastern dialects) of Modern Standard Ukrainian became established. But these efforts lacked historicity. Building on the achievements of his Romantic precursors from Poltava and Kharkiv, Taras Shevchenko first met the challenge of forging a synthetic, pan-Ukrainian literary language encompassing both the historical (eg, the use of archaisms and Church Slavonicisms) and the geographical dimension (the use of accessible dialects). Panteleimon Kulish combined the same elements but in different proportions. Shevchenko's and Kulish's contemporaries and immediate successors failed to grasp the fact that historical and stylistic synthesis was the essence of language reform. The breadth of the geographic synthesis, however, secured a wide influence for the new literary language. This was the principle which gave direction to the linguistic strivings of the writers grouped around the journal Osnova (Saint Petersburg). Later it had a determining influence on the character of Borys Hrinchenko's dictionary, which, despite its apparent dialectal nature, played a major role in normalizing the literary language. The new literary Ukrainian began to be used in scholarship and publicism in the early 1860s. This development was interrupted by Petr Valuev's circular (1863) forbidding Ukrainian-language printing and book publishing within the Russian Empire. As Ukrainian publishing shifted to Austrian-ruled Galicia, the new literary language took root there, imposed the Middle Ukrainian-based literary language, and thereby undercut the attempts of local Russophiles to establish Russian as the literary language. In Galicia the new language became strongly influenced by the local vernacular. The impact of the northern dialects was not particularly evident, although they were used by writers living in Chernihiv gubernia (eg, Panteleimon Kulish, Borys Hrinchenko, Mykhailo Kotsiubynsky). In the debate on Standard Ukrainian at the turn of the century, Vasyl Mova, Olena Pchilka, and Mykhailo Starytsky, and then Kotsiubynsky, Lesia Ukrainka, Ivan Franko, and Modest Levytsky, favored a synthesis of the Western and eastern vernaculars, while Hrinchenko, Ahatanhel Krymsky, and Ivan Nechui-Levytsky argued for eliminating western Ukrainian influences. When Standard Ukrainian ‘returned’ to Russian-ruled Ukraine after the lifting of the ban on the Ukrainian language (ie, the Valuev circular and Ems Ukase) during the Revolution of 1905, it already had a synthetic character. But its central Ukrainian foundation remained untouched. 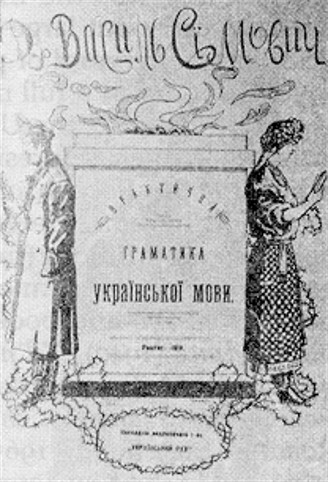 The expansion of Standard Ukrainian into all social spheres and literary genres in the independent Ukrainian state of 1917–20 and in Soviet Ukraine in the 1920s necessitated its normalization and codification (see Lexicology, Orthography, and Terminology). Two distinct currents of opinion arose in this regard. Supporters of a purist ‘ethnographic’ orientation (see Purism), such as Yevhen Tymchenko, Serhii Smerechynsky, Olena Kurylo (at first), and Vasyl Simovych, advocated the adoption of the popular vernacular as the standard. It was, however, the school led by Oleksa Syniavsky, which took into account not only tradition but also the development of the language, that gained the upper hand and determined the norms of orthography, orthoepy, morphology, and syntax. Joseph Stalin's abolition of the policy of Ukrainization in the early 1930s and his suppression of Ukrainian national and cultural life were accompanied by bureaucratic attempts to restrict the use of Standard Ukrainian. It was totally eliminated from the military sphere and severely restricted in the scientific and technological spheres. Western Ukrainianisms and European loanwords existing in Ukrainian but not in Russian were expunged, and the language was reoriented toward the eastern Ukrainian dialects and Russian vocabulary and grammar. Changes in orthography, grammar, and lexicon were carried to such an extreme that some of them were to be rejected even in the official orthography adopted in 1946 and in the 1948 Russian-Ukrainian dictionary. The general direction of Soviet language policy, however, has remained unchanged. Despite constantly increasing influence of the Russian language in Ukraine (see Russian-Ukrainian linguistic relations), the general character of Standard Ukrainian as it was defined by Taras Shevchenko and Panteleimon Kulish and codified by Borys Hrinchenko, Oleksa Syniavsky, and the VUAN dictionaries of the 1920s remains intact.